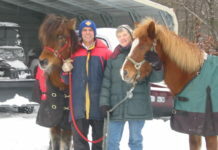 In my last blog, Horse Shopping – From the Group Up, I talked about horse shopping for my husband. 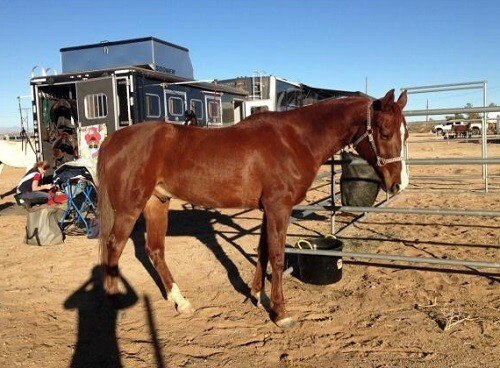 The winner of this search was horse #3, an 8-year-old, half-Arabian gelding named Tyler. Tyler passed the pre-purchase exam with flying colors. 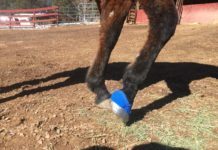 Radiographs of his feet and joints were outstanding, so much so, in fact, that the examining vet commented on him, saying “You’ve got a good one here.” I was pleased with my choice. A week later, we loaded up the rig for the Fire Mountain endurance ride in Ridgecrest. This is one of our favorite winter desert rides. Our plan was to pick up Tyler in Arroyo Grande on the way (more or less) to Ridgecrest. We rolled into Sun King Farms just before dark and loaded him into the trailer without much fanfare. Tyler was about to get his eyes opened to what his new life as an endurance horse was going to be like. That night we drove to Bakersfield and stayed at an overnight stabling facility. He got a round pen to himself and the mares shared the arena. It was much better for them to be able to move around, rather than being tied to the trailer all night. The next morning, we loaded up and headed for Ridgecrest. Having Tyler with us posed a problem: He had never been on a HiTie and I didn’t want to tie him within striking distance of the mares. As luck would have it, there was one small pipe corral at the far side of camp. We set up next to it and Tyler got the corral while the three mares got their HiTies. All was calm in our herd. Tyler learning about life in base camp. For the next two days, Tyler got to witness all the activity from his corral. 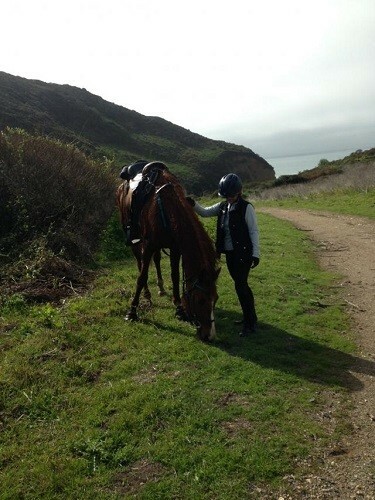 We took him for a couple of short trail rides each afternoon, and he handled it all very well. On Sunday night, we loaded up and drove back to Bakersfield. This time, we over nighted at the rodeo grounds, and Tyler spent the night tied for the first time. He was still there in the morning, so I’m considering that a success. Once I got him home, I let him chill out for a few days to recover from four days on the road and to get accustomed to his new surroundings. 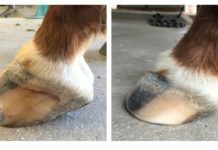 During this time, I went about the business of getting him set up with a properly fitting saddle and bridle, and measured his feet for new Easyboot Gloves. Here is where I ran into some trouble. Although Tyler has always been barefoot, he hadn’t been getting a proper barefoot trim and as a result his feet were slightly misshapen. I knew this could be corrected over time and so I didn’t worry about it. His right front measured 130mm wide x 130mm long. His left front measured 135mm wide x 130 mm long. I ordered a pair of 2Ws for him. The 2W was almost too big for his right front foot. His foot wasn't so much flared as it was just much wider at the base than the top—truly bell shaped. His left front was similarly shaped but with some flare on the sides. 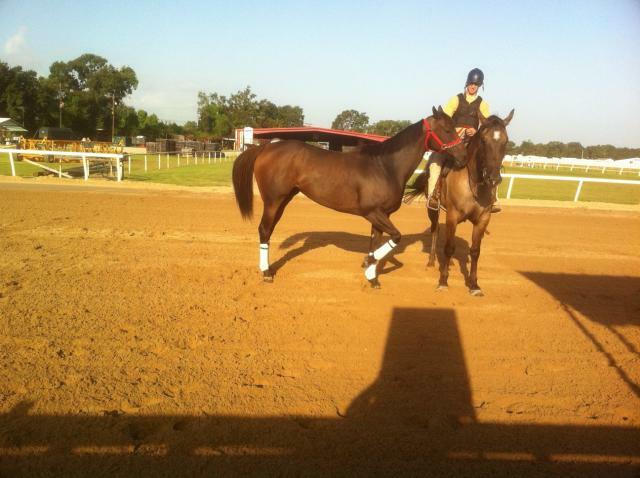 As a result, the 2W fit his width but was too big front to back, leaving a void between the boot and the hoof wall. I know I can reshape his right front foot and fit him into a 1.5W, but I’m not sure what to do about the left front. This is where trial and error has served me well (although I’m open to suggestions). So far, the 2W boots have been sufficient for Tyler’s first few training rides. I used extra tape to fill the void on the left front. 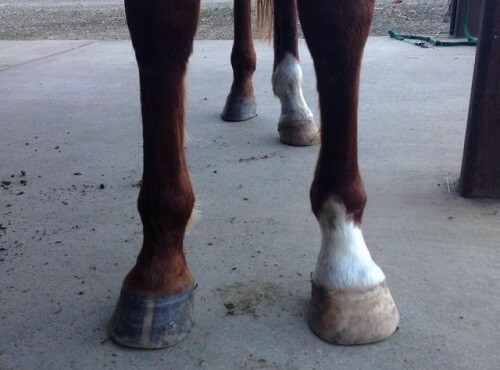 However, before I can do any speed work with him I will need to get him into properly fitting boots. His back feet, by the way, are normal. They fit into a regular 1.5 boot. My training program for Tyler is pretty conservative. He’s already proven to be great on the trail. He likes to go out in front and he doesn’t spook at ANYTHING. I like that the most about him. He’s very balanced on his feet and watches where he puts them. He’s also light and balanced in the bridle. These are all desirable attributes in a horse for my husband. His immediate future will be a lot of long, easy trail rides and tag-alongs to rides so he can get further exposed to life in base camp. Tyler's first long training ride at Pt. Reyes National Seashore. Stay tuned for his progress and how I solve my booting challenge with him. Next articleHave Ice? EasyShoes with Studs!